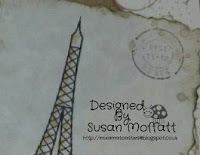 A quick post to announce hte winners of our Mini July BLOG HOP stamp release! Good morning and Happy Tuesday! 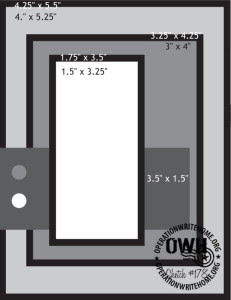 Today I'm sharing a Journal Card that I created for my 6x8 Snap Binder. At one time I used to scrapbook using Creative Memories products, and that fell on the wayside as work and family life took precedence. I really want to finish scrapbooking our family photo's, and now that I'm a stay-at-home mom ... what better time to start. I've been eyeing all the new binder(s) available for scrapbooking, which is so much more up my alley that I finally gave in and purchased a 6x8 Snap Binder in pink. Instead of starting where I left off, I am going backwards starting with my daughter's 21st Birthday this year. To get myself started I pulled out the NEW Wish Big stamp set to decorate a Journal card. I stamped the "Wish Big" sentiment, and the stand alone present several times on the card, and then again on white cardstock. A Colored Clear Star Pen was used on the open spaces of the sentiment on the card, and after coloring the extra's with Copic Markers I paper-pieced the candles and presents. Yellow Stickles was used on the candle flame. Final add was the "Party Time" sentiment. Here is the final page put together. One down and many more to go. I used some of my old Creative Memories stickers, and a Celebration Vellum Quote to finish the page. 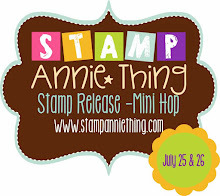 I hope you are inspired by today's project to head on over to Stamp Annie*Thing Store to check out all of the amazing stamps that we have to offer. Wow, where do these weeks go? It's a pink Monday and a Stamp Annie Thing design team day for me, Barb from BugBites. This week I am using the Stamp Annie Thing Ooh La La stamp set. The girl is so cute and there are many sentiments to go with it. I have a super cute pink and black Carta Bella paper pack that has some super papers in shades of pink, black and grey that inspired my design. I used my copic markers and did some paper piecing for the stamped image. I then did a little piercing around the mat for a faux stitched look. My canine companion is popped up on two thicknesses of foam tape. Thanks to Ann over at SVG Cutting Files, who created this Poodle file for me. You can find the link to this sophisticated canine file here. The card is finished off with some pretty pink trim and bling. This image and the sentiment are all part of the Ooh La La stamp set which you can find here. 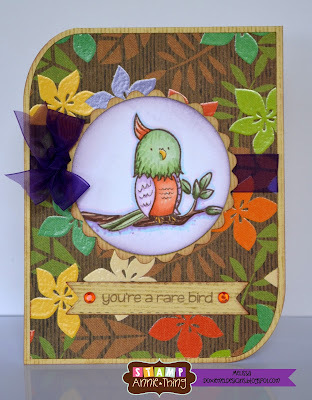 Im glad you stopped by to check our Day #2 of our July New Stamp Release! For today I used the new WISH BIG stamp set. This is Megan and I just adore her! She is simple the cutest little birthday girl! I wanted to created something other than a card, so I designed this awesome new Birthday Candle Tube Holder to go with her! The Wish Big Stamp set is AVAILABLE NOW to buy! She is so much fun to color with those wide bangs of hers! Close up of Colored Megan stamp! Close up of the balloon bunch stamp! Now for the details on how you can WIN this Stamp!! Mermaids! July Hop Mini Release! Hi everyone! Today I am super excited to share with you a peek of our latest stamp... MERMAIDS! 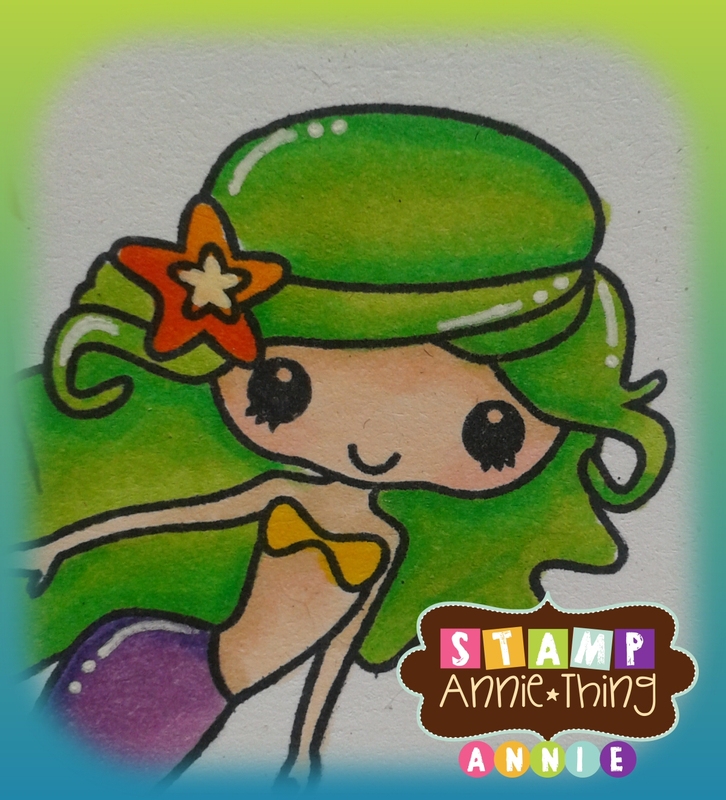 I just love the beach and sunshine...Im a Florida girl afterall, so it was inevitable that I would eventually have a Mermaid stamp! This new stamp set is available to buy RIGHT NOW in our store!! Get them when you can, we have a limited supply! 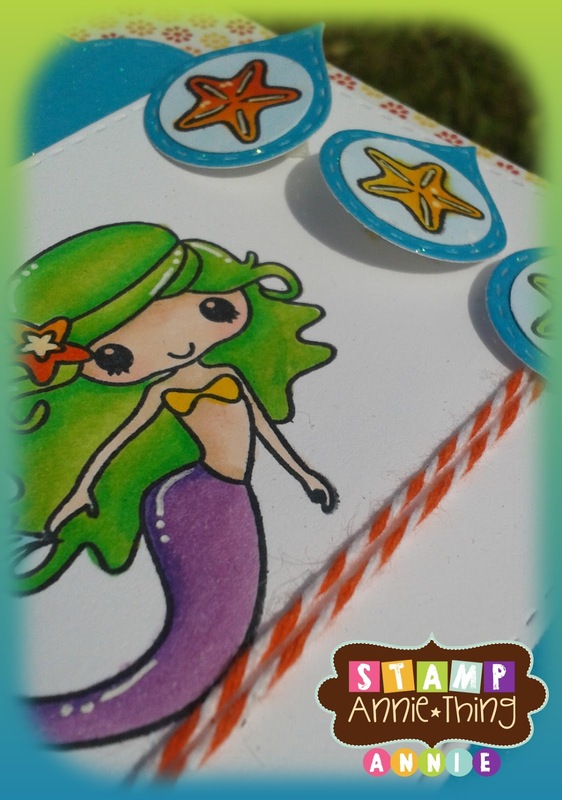 This adorable stamp set contains the two mermaid images, some great little sentiments and some other small ocean/sea images. Possibilities are endless as to what you can created! For today's release, I created a CAS card. I figured Mermaids are magical creatures, so wanted to have fun with her coloring..and since green IS my favorite color...why not? 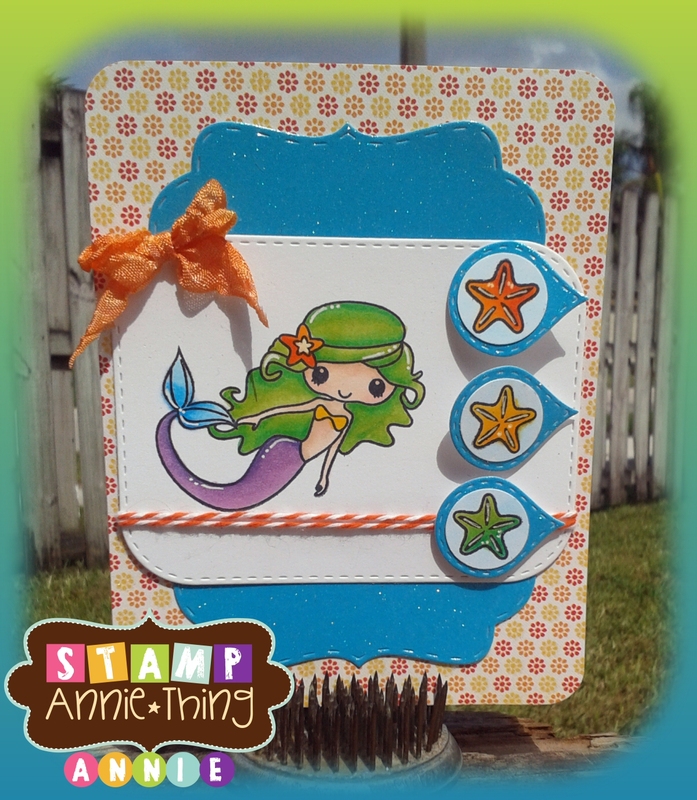 I obvioulsy used the swimming Mermaid Stamp and the Sand Dollars too. I layered her on 2 Dies from Jaded blossom: the Layered Journal Die and the Bag Topper Die. 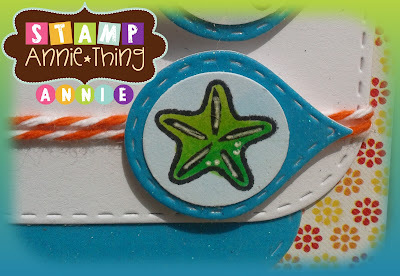 I pop dotted the sand dollar on the small dies in the Layered Journal Die Set. I also added some fabulous Rumple Ribbon in Autumn Spice and Trendy Twine in Orangesicle! A close up of the fun and funky color combo for her hair! and a nice side view of the card on an angle. I hope you enjoyed my simple card! Now... for your chance to WIN this new set for FREE! 2- You MUST leave a comment on all the stops along the way! One Winner(*) will be randomly chosen and announced on MONDAY, July 29, 2013. So what are you waiting for? Head on over to the next stop on the BLOG HOP... and have FUN! Here is the complete Line Up for today! He all, its Barb from BugBites and I have all the dirt for ya today. First off, it's Monday and my design team day here at Stamp Annie Thing. My card for you today was made using the super adorable little stamp from the Here's the Dirt stamp set. She is just so sweet she's got me smiling. I used some country looking papers form a 6x6 paper pack. I paper pieced her outfit and colored the rest with copic markers. The sentiment is also from this stamp set. I added some bling in the corners and a button with a twine bow. You too can get this cutie patootie stamp by clicking here. 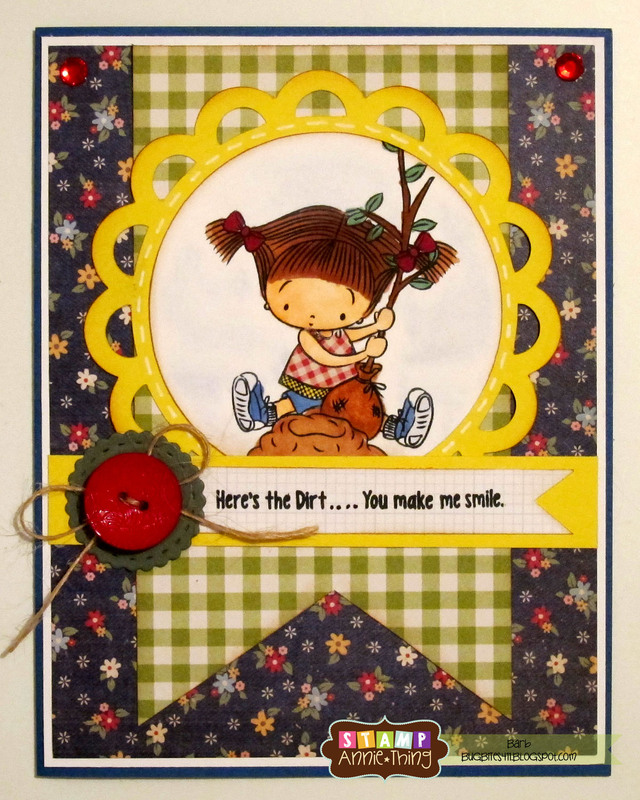 Now for the rest of the dirt....Stamp Annie Thing is releasing two new stamps sets later this week. So mark your calendar and be sure to stop back in a couple days to see what's new! Good morning and Happy Monday to you! I have some exciting NEWS to share!!! 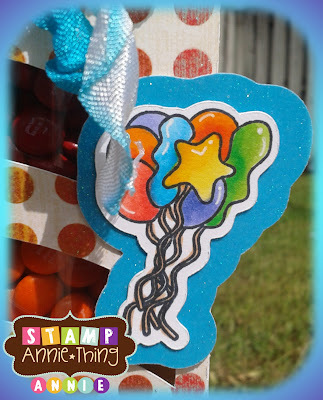 Stamp Annie*Thing is Sponsoring this weeks Love to Create Challenge, and the Challenge is all about Hugs & Wishes!!! 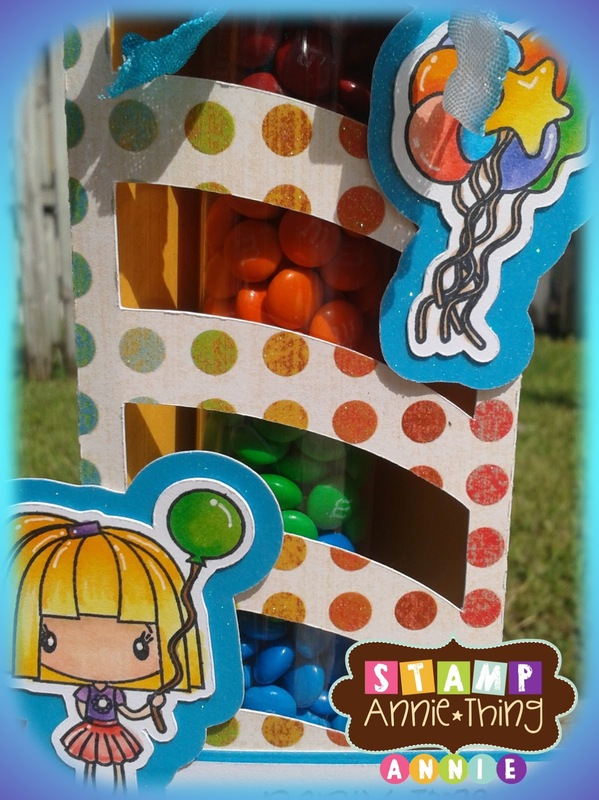 with the Ooh La La Stamp Set! The Love to Create Designers had the pleasure of working with the Digital version of the Ooh La La stamp set, and I have to say their creations are absolutely AMAZING!!! Here is a Sneak Peak of one of the Love to Create Designers creation for this weeks Challenge. 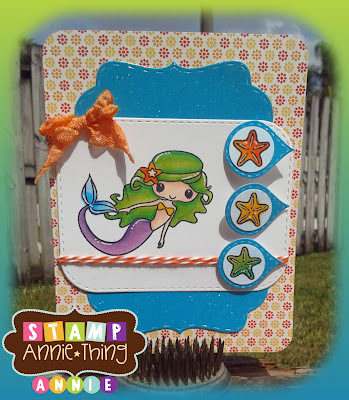 Head on over to the Love to Create Challenge Blog to see the amazing DT Creations, and find out how you can win a stamp set from Stamp Annie*Thing! Stamp Release - Mini Hop starting Thursday, July 25th. Good morning! Melissa here to share a project for "a lucky dog". The dog is from Stamp Annie*Thing's Dog Gone Cute Stamp set. I paper pieced the dog and shirt but colored his jeans with my Copic markers. A plain white bag was stamped with dog themed accessories from the stamp set and the bag is topped with a Bone Shaped Card from SVG Cutting Files. To make the bag topper, just place the card over the top of your bag and punch two holes for some ribbon. I made this little present for my friend who has a "fur baby" that she brings to my house.. well, she brings that dog everywhere! He is a lucky dog! I absolutely love this bunny from the Bunny Hugs to You stamp set. You can either have a Girlie Bunny or a Masculine Bunny, and I obviously went Girlie with this one. I used the repetitive technique to create motion for her. The final image was colored with Copic Markers, and I paper-pieced the inside of the ears, the hair bow and her skirt. Here's a look at the Bunny Hugs to You stamp set. 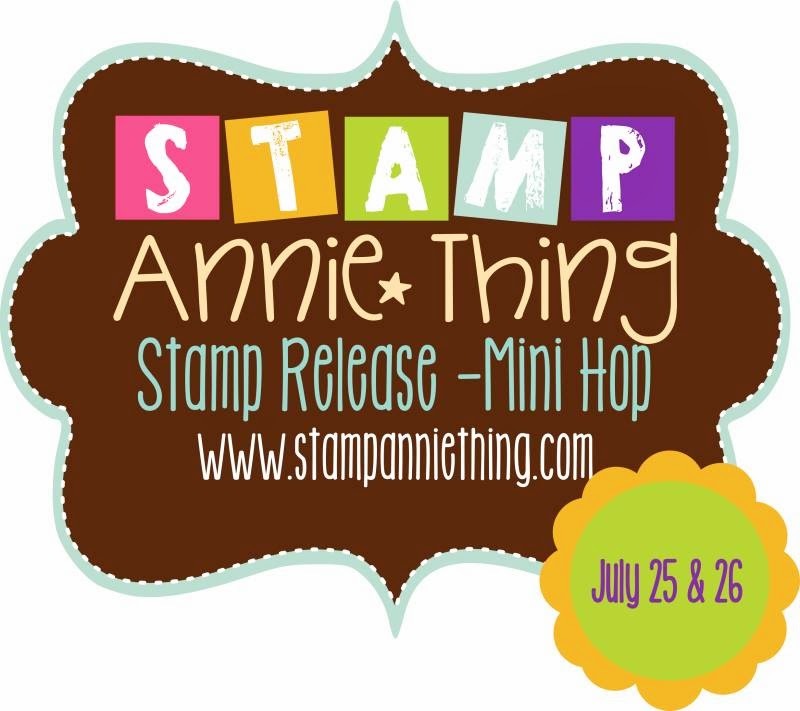 I hope you are inspired by today's project to head on over to Stamp Annie*Thing Store to check out all of the amazing stamps that we have to offer. I'll see you on Monday, July 22nd, with a SUPER FUN post all about ... Hugs & Wishes. Happy Monday! It's Barb from BugBites back for my weekly design team post. 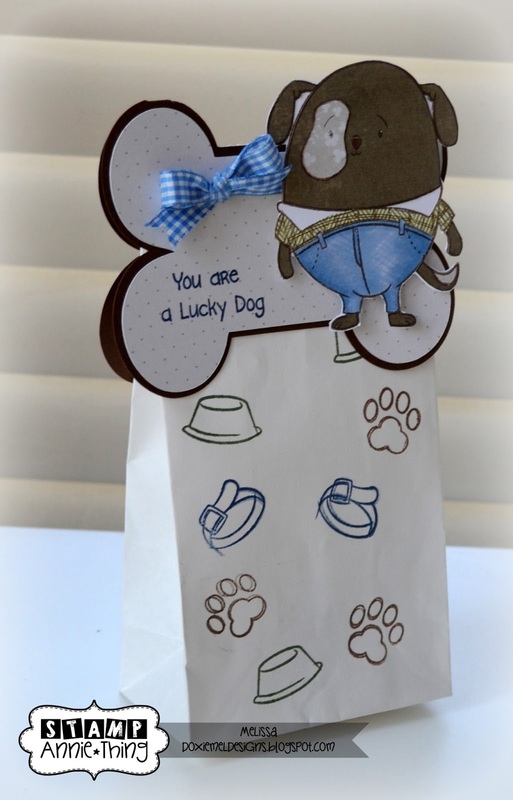 Today, I have this super cute treat bag to show you. I came across these mini peanut butter sandwich cookies at the craft store of all places. 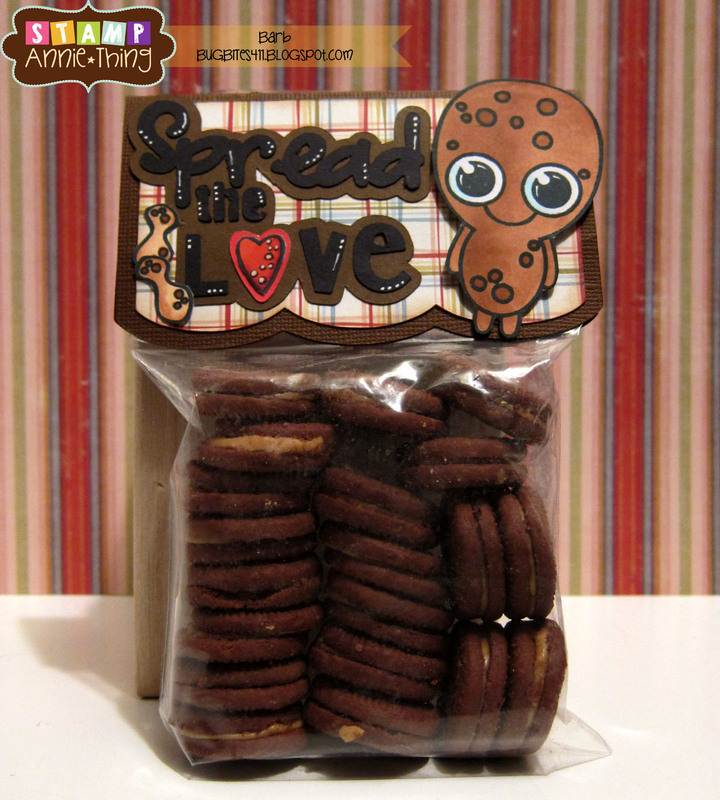 The cookies and this cute little peanut stamp from the Our Lil Peanut stamp set were a perfect match. Now I just need a big cold glass of milk. I made my own treat topper from a silhouette card base. I stamped the peanuts, colored them with my copics and fussy cut them before pop dotting them to the topper. The Spread the Love title is from SVG Cutting Files. Ann made it special for my project. If you want to pick up this or any of the other Lil stamp sets, just click here. See ya next Monday with another super cute Stamp Annie Thing project. I'm so excited about it, it has me seeing pink! Good Morning! Melissa here to share a Simple card made with Stamp Annie*Thing's Fun Starts Here set. This is a darling set with many possibilities. 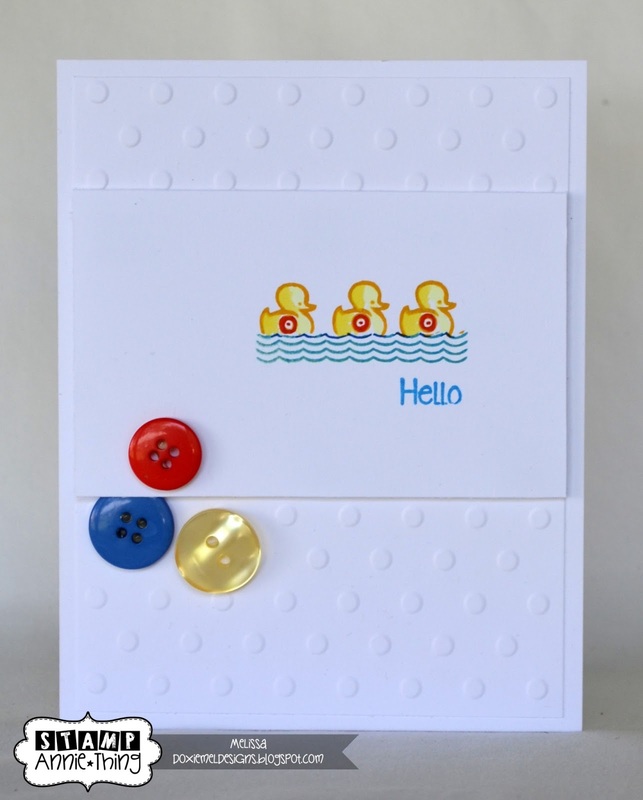 I selected one stamp from the set, and just love the graphic quality of the ducks floating on the water. The image was stamped twice masking off one side each time. Thanks for stopping by the blog today- Have a wonderful day! Good morning! Ruza here to share an Invitation I made. 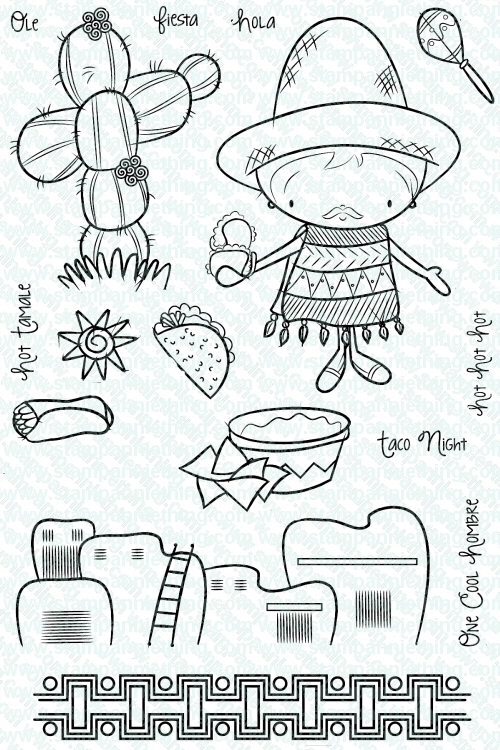 I made a "Taco Night" invitation using some of the stamps from the One Cool Hombre stamp set. First step was to stamp and color the yummy food, and cut the pieces out. Next was the hard part. I made several mistakes while creating this frame with the border stamp, a ruler, and a thin black marker. So I pulled out my Crop-A-Dile to punch the holes where the circles are in the stamp, and a Fingertip Blade was used to cut out the rectangles in the design. Once the frame was complete, I layered it on the background and the cardbase, and then I added the yummy food in the center with the sentiment. 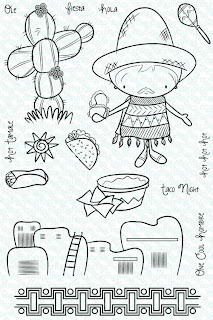 Here's a look at the One Cool Hombre stamp set. Happy Monday. It's Barb from BugBites. It was so nice to have that long holiday weekend, right. 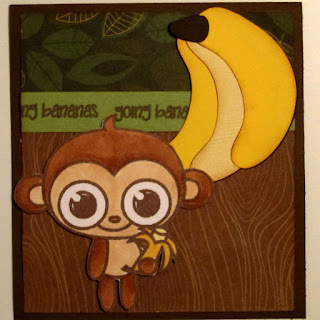 Today for my design day project I used the Our Lil Monkey stamp. It's kinda how I am feeling this week since I am trying to get a bunch of things done this week before I get to go on vacation for 10 days- yeah! Don't worry, I have worked ahead so I wont miss any Monday design day projects. 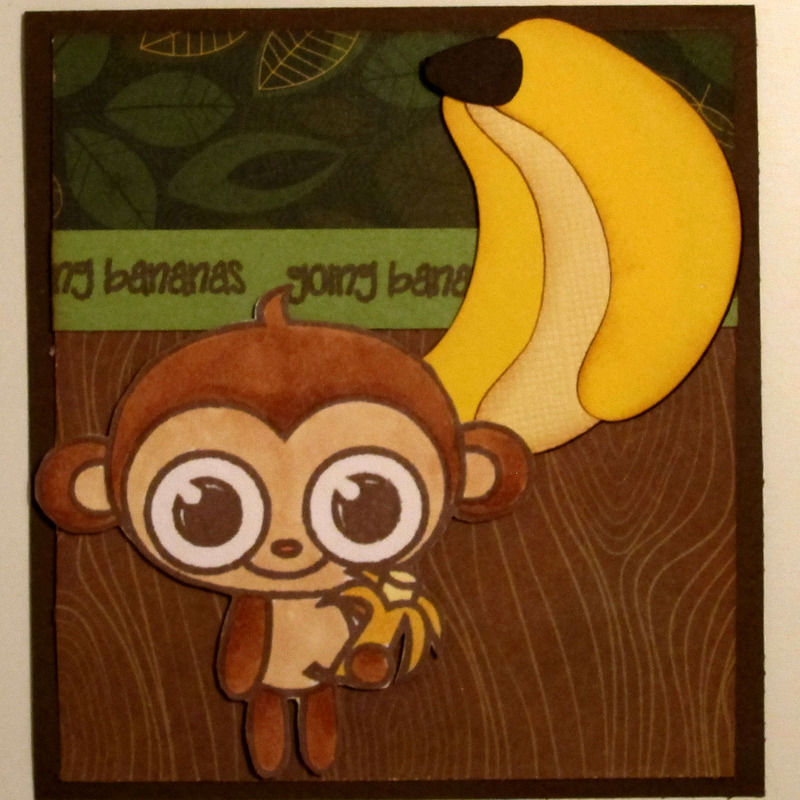 I colored my lil' monkey with the Copic markers and then cut him out. I used some foam tape to add him to the front of my card. Oh, check out those cute bananas. Ann made those special for me..she is so great. Happy Friday! Melissa here with a card for you today. 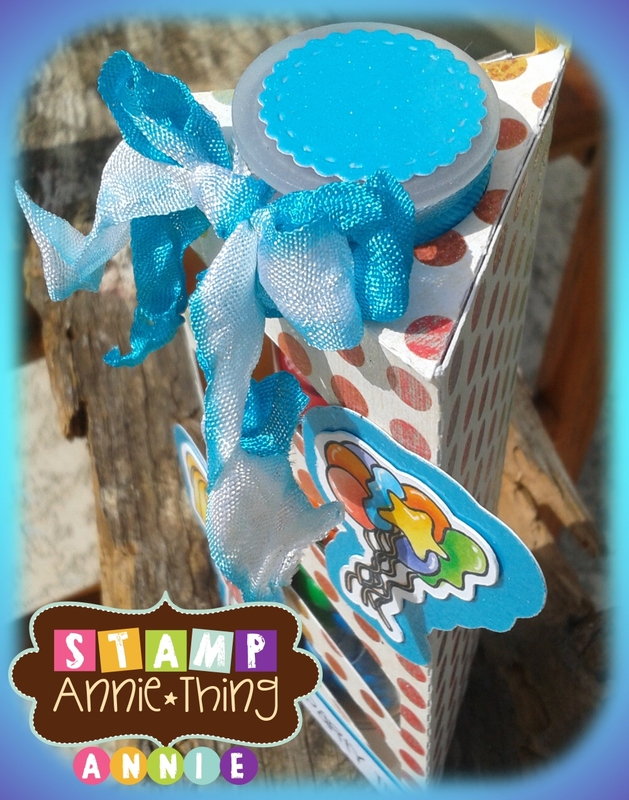 The main image is from Stamp Annie*Thing's A Rare Bird set. The bird is super fun to color.. you can let you imagination run wild with this birdy. I decided to pull the tropical colors from the background paper. This image makes a fun card to send out to your "rare" good friends. The unique card shape is from SVG Cutting Files, Wavy Card Base. Thanks for visiting today and hope your weekend is special. Good morning! Ruza here a day later than normal, but I wanted to make sure that my Patriotic card was perfect to showcase Rose being so proud to be a part of the upcoming 4th of July Celebrations. Rose is from the Party in the USA stamp set. I colored Rose with my Copic Markers, cut here out and put her on the side. I decided to use an Operation Write Home Sketch (#178) since that is where my card will be going. Once a week OWH provides sketches for card makers to use for making cards that are sent to our troops. If you would like more information about Operation Write Home click here to head on over to their blog. Happy Monday. 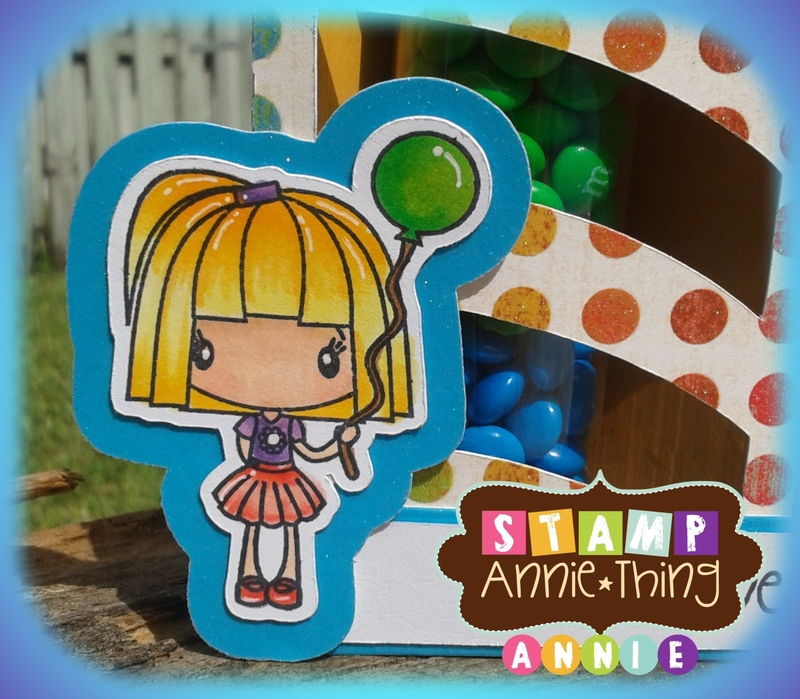 It's Barb from BugBites and as promised the other day, I am back with another treat holder for the upcoming holiday featuring another Stamp Annie Thing Stamp set...or two! For this treat holder I am mixing and matching stamps. I used the Stamp Annie Thing Lulu's Valentines Day stamp set to start. Yes, you read right, the Valentine stamps have gone patriotic! Lulu is the main show in this stamp set. I stamped, colored and paper pieced, yup, did it all. 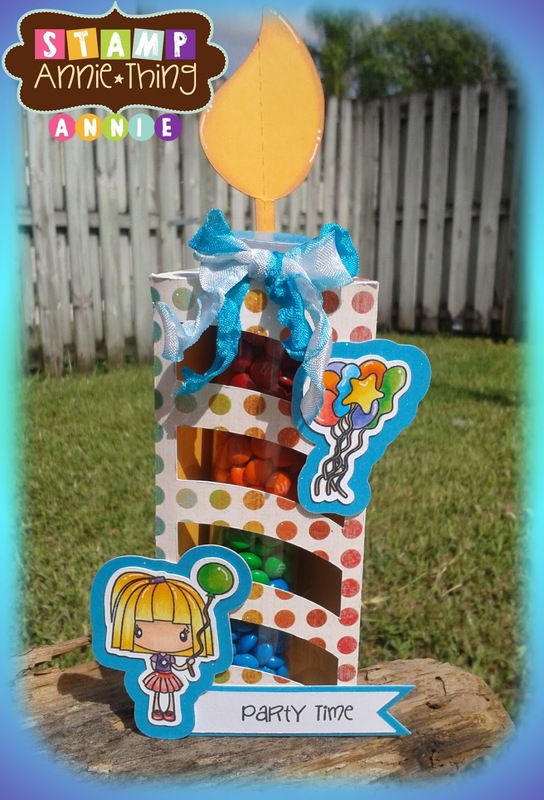 The candy tube holder and stars behind it are from the SVG Cutting Files online store here. I sized it to fit the extra large candy tube I found at the local craft store. I then added some twine around the top and a sentiment from the second stamp set today, Stamp Annie Thing Party in the USA. All of the Stamp Annie Thing stamps can be mixed and matched. The possibilities are endless.